Mahoning Valley Racecourse concluded its Fall Meet and 2018 calendar season and did so with yet another annual increase in wagering. Since its launch in 2014, the young racetrack in Austintown, Ohio, has seen handle increases each calendar year since opening its doors. All told, wagering volume on the Mahoning product for 2018 increased 10.6% compared to the prior year. For the Fall Meet, jockey Luis M. Quinones captured his first riding title at Mahoning Valley, piloting 31 of his 189 mounts to the winner’s circle. Quinones also finished third nationally in 2018 with 281 wins. While Quinones notched his first riding title, it was more business as usual in the trainer’s standings as Jeff Radosevich collected yet another training title. For the Ohio-based Radosevich, there’s little better than winning another training title on his longtime stomping grounds. Mahoning Valley held its signature event – the $250,000 Steel Valley Sprint – on November 19 and the marquee race of the meet didn’t disappoint as Trigger Warning won an epic stretch duel with Bobby’s Wicked One. Trained by Mike Rone, Trigger Warning was put on the lead early under Irwin Rosendo and then engaged in a fierce battle with the runner-up from the top of the stretch to the wire and was made the winner after Tyler Gaffalione’s claim of foul was not allowed. In the $75,000 Hollywood Gaming Mahoning Distaff on the Steel Valley Sprint undercard, the gray mare Puntsville was able to hold off a late charge from Lake Ponchatrain to score her 13th victory in 25 career outings. While she did not take part in any of the unrestricted stakes Mahoning offered during the Fall Meet, Leona’s Reward was tabbed the horse of the meet after dominating Ohio-breds in her three starts in restricted stakes events. Trained by Tim Hamm, Leona’s Reqard romped by eight-lengths over Ohio-bred fillies and mares in the Ohio Debutante Handicap on November 3 and followed that up with a win against the boys in the Ruff/Kirchberg Memorial two weeks later. In her final start of the meet, the daughter of Parents’ Reward returned to face fillies and mares in the Bobbie Bricker and again cruised to a seven-length score. All told, Leona’s Reward banked a total of $135,000 during the Fall Meet for her owners Blazing Meadows Farm LLC and Michael Friedman. 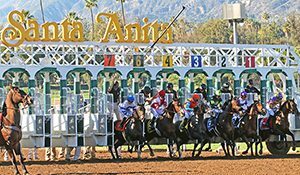 Santa Anita Park’s 2018-19 Winter Meeting got off to a record-breaking start on Wednesday, as the track posted an all-sources pari-mutuel handle of $20,491,016, a 19 percent increase over a year ago and an all-time opening day record. Wednesday’s opening day crowd of 41,373 contributed to an on-track handle of $3,463,535, a five percent increase over last year’s $3.3 million. On-track attendance was up year to year three percent. In measuring the significance of Wednesday’s numbers, the last time Santa Anita opened on a Wednesday was 2012, when all-sources handle was $13.4 million, making yesterday’s handle of $20.4 million a whopping 52 percent increase. On track attendance on Wednesday, Dec. 26, 2012 was 27,273, making yesterday’s 41,373 a 52 percent increase. The recently-concluded Fall Meet at Churchill Downs distributed record prize money for horsemen and delivered a great deal of substance for horseplayers as numerous memorable moments were produced during the historic Louisville racetrack’s action-packed, four-week stand. The popular 21-day Fall Meet, which ran from Oct. 28 through Nov. 25, was spearheaded by a record-equaling ninth visit by the Breeders’ Cup World Championships on Nov. 2-3 that brought together the best horses, jockeys, trainers, owners and breeders from around the world. When excluding the two-day Breeders’ Cup, a record daily average of $604,432 in purses was paid to horsemen over the 19 days, which was a lofty 20.9% increase from the $499,959 paid daily a year ago. Also, the average purse per race was $57,135, which was up 20.3% from 2017’s $47,507. The significant growth in purses was attributed to early returns from state-of-the-art historical racing machines at Derby City Gaming, Churchill Downs Incorporated’s new $65 million facility that opened in mid-September at nearby 4520 Poplar Level Road. For example, maiden special weight races were worth a record $76,000 and allowance races ranged from $78,500 to $90,000. For some perspective, the average purse per Fall Meet race has grown 76.5% in a five-year period. At the 2013 Fall Meet, the average purse was $32,373 and average daily purses were $328,911. During the 19 days, Churchill Downs staged 201 races, which lured 1,789 starters for a strong average of 8.9 horses per race – the same as the 2017 Fall Meet. The season’s racing product featured fields of seven or more in 89.6% of the races. There were only 21 races with six or less starters. The 129th Fall Meet was anchored by the 35th Breeders’ Cup World Championships, which showcased 14 races and 13 Grade Is with purses and awards totaling a record $30 million. Much like its previous eight visits to Louisville, the prestigious two-day event delivered numerous dramatic and memorable moments. Southern California-based 5-year-old Accelerate (22-10-5-5—$5,792,480), owned by Hronis Racing LLC, made a case for Horse of the Year honors with a one-length win over Gunnevera in the $6 million Breeders’ Cup Classic (Grade I) for his fifth Grade I win of the year. The victory gave trainer John Sadler his first Breeders’ Cup triumph after going winless with his previous 43 starters. Joel Rosario rode the winner, and his mounts amassed an event-high $5,768,840 over the two Breeders’ Cup days after winning with four of his 13 mounts, including a trio of Breeders’ Cup conquests. The megastar of Breeders’ Cup Saturday was Juddmonte Farms Inc.’s homebred 4-year-old filly Enable (GB) (11-10-0-0—$10,705,631), who became the first horse to win both the prestigious Prix de l’Arc de Triomphe (GI) and $4 million Longines Breeders’ Cup Turf (GI) with a thrilling three-quarters of a length win over Coolmore’s 3-year-old filly Magical (IRE). The victory down the middle of the Matt Winn Turf Course, her ninth win in a row, gave world-famous jockey Frankie Dettori his 14th Breeders’ Cup win and greatly-admired trainer John Gosden his fifth. Other Breeders’ Cup highlights included Longines Kentucky Oaks (GI) winner Monomoy Girl’s victory over elders in the $2 millionLongines Distaff (GI) to cement champion 3-year-old filly honors for locally-based jockey Florent Geroux and trainer Brad Cox; back-to-back Breeders’ Cup wins by Roy H (Sprint) and Stormy Liberal (Turf Sprint) both for trainer Peter Miller and the ownership of Rockingham Ranch and David Bernsen; a fourth Grade I win of the year for Peter Brandt’s Sistercharlie (IRE) in the $2 million Filly & Mare Turf (GI); a dominant 2 ¾-length conquest by City of Light in the $1 million Dirt Mile (GI); and a stunning performance by utterly superiorNewspaperofrecord (IRE) in the $1 million Juvenile Fillies Turf (GI). Bulletin (Juvenile Turf Sprint); Expert Eye (GB) (Mile); Line of Duty (IRE) (Juvenile Turf); and Shamrock Rose (Filly & Mare Sprint) also won Breeders’ Cup races. The two-day Breeders’ Cup attendance was 112,672 – the third highest in event history – and total betting reached more than $157.4 million, which was the fifth highest total since Breeders’ Cup adopted a two-day format in 2007. In addition to the Breeders’ Cup, highpoints during the Fall Meet included Steve Landers’ 5-year-old Leofric, who turned back a determined challenge by 3-year-old Bravazo in deep stretch to win a thrilling renewal of the $500,000 Clark Handicap Presented by Norton Healthcare (GI) – the traditional “Black Friday” headliner on Nov. 23 and the most lucrative non-Breeders’ Cup race on the 30-race, $30.9 million stakes schedule. Leofric capped a Fall Meet stakes treble for Cox, the 38-year-old Louisville native who also landed his 1,000-career win on Nov. 18 (although it occurred at Fair Grounds). In addition to stakes wins by Monomoy Girl and Leofric, the Cox-trained Mr. Misunderstood remained perfect in four stakes appearances over the Churchill Downs turf course when the 4-year-old gelding owned by Staton Flurry surged to the lead in late stretch to land the $100,000 River City Handicap (GIII) on Nov. 17. Churchill Downs’ strong racing program for 2-year-olds was emphasized by impressive stakes performances on its two 14th annual “Stars of Tomorrow” programs, which are entirely devoted to 2-year-olds. Signalman, who finished third in the Breeders’ Cup Juvenile (GI) 22 days earlier, earned 10 points on the 35-race “Road to the Kentucky Derby Presented by Woodford Reserve” series when he turned back a late charge from Plus Que Parfait to win the $200,000 Kentucky Jockey Club (GII) by a neck on Nov. 24. Earlier that day, Liora – the longest shot in the field of eight 2-year-old fillies at odds of 27-1 – led every step of the way and narrowly repelled a late bid by odds-on 3-5 favorite and Breeders’ Cup Juvenile Fillies (GI) runner-up Restless Rider to win the $200,000 Golden Rod (GII) for fillies by a scant nose. Also that day, the Larry Jones-trained Super Steed, a son of 2010 Kentucky Derby winner Super Saver, arose as a tantalizing prospect with an impressive first-level allowance win on the “Stars of Tomorrow” undercard. Golden Rod winner Liora ended the season as the only horse to win multiple times at the Fall Meet. Another 2-year-old that impressed onlookers during the meet was Improbable, who dominated rivals by 7 ¼ lengths in the $100,000 Street Sense on the Breeders’ Cup Friday undercard. Like Breeders’ Cup Juvenile winner Game Winner, Improbable is trained by Hall of Famer and five-time Kentucky Derby winner Bob Baffert. Game Winner was the clear 5-1 second choice in Pool 1 of the Kentucky Derby Future Wager behind the pari-mutuel field of “All of 3-Year-Old Colts and Geldings” that closed as the 6-5 favorite. Improbable ended as the 17-1 fifth betting choice and Signalman closed at 30-1 in the field of 24 betting interests. Offered for the 21st consecutive year on Nov. 22-25, betting over the four days totaled $258,389 and was up 3.2% from last year. Also offered concurrently was the Kentucky Derby Sire Future Wager in which “All Other Sires” (9-2) and Tapit (6-1) attracted the most attention in the betting pool that reached $32,924. Other stakes winners during the Fall Meet were Divine Miss Grey in the $200,000 Chilukki (GII); Prado’s Sweet Ride in the $200,000 Falls City Handicap (GII); Princess Warrior in the $200,000 Mrs. Revere (GII); Rocketry in the $200,000 Marathon (GII); English Affair in the $100,000 Cardinal Handicap (GIII); Hot Springs in the $100,000 Commonwealth Turf (GIII); Dunph in the $300,000 Spendthrift Juvenile Stallion Stakes; Audible in the $200,000 Cherokee Run; Mother Mother in the $100,000 Rags to Riches Overnight Stakes; Uno Mas Modeloin the $100,000 Bet On Sunshine Overnight Stakes; and Vertical Oak in the $100,000 Dream Supreme Overnight Stakes. The season champions were decided on closing day. Circuit-newcomer Tyler Gaffalione (118-21-15-8—$1,201,027), 24, won 10 races on closing week, including four on “Black Friday,” to narrowly edge 16-time local champion Corey Lanerie (126-20-21-20—$1,201,505) and Spring Meet leading rider Brian Hernandez Jr. (134-20-19-17—$2,002,802), 21 wins to 20, en route to his first title as Churchill Downs champion jockey. Edgar Morales (136-18-18-15—$831,412), who rode as an apprentice through Nov. 16, and Ricardo Santana Jr. (106-18-17-19—$1,432,475) tied for fourth with 18 wins each, one more than Florent Geroux (101-17-16-15—$2,705,991), who led all riders with five stakes wins. Hall of Fame conditioner Steve Asmussen (72-11-14-10—$971,442) won with his final starter of the meet Sunday (Share the Upside in Race 11) to tie Dallas Stewart (40-11-7-3—$803,850) at 11 wins for his record-extending 20th Churchill Downs training title. For Stewart, it was his first local title and he did it with a considerably smaller operation than powerhouse Asmussen. Kenny McPeek (57-9-9-9—$1,164,663) was third with nine victories and was followed by Cox (52-8-12-7—$2,169,970), Tom Amoss (23-6-0-4—$328,664), Mike Maker (47-6-6-3—$436,451) and Ian Wilkes (54-6-4-5—$381,836). Ron Paolucci’s Loooch Racing Stables (16-5-1-0—$182,123) emerged as the Fall Meet leading owner with five wins and one second from 16 starters and edged Gayle Benson’s G M B Racing (7-4-1-0—$251,180), G. Watts Humphrey Jr. (25-4-6-4—$317,276) and Prince Khalid Abdullah’s Juddmonte Farms Inc. (9-4-1-0—$3,444,251), who each had four trips to the Woodford Reserve Winner’s Circle. A total of 147 horses were purchased through claiming races during the Fall Meet for a total of $2,638,500. For the year, a total of 428 horses were claimed during Churchill Downs’ three racing meets for a total of $8,483,000, which resulted in a $508,980 sales tax revenue for the Commonwealth of Kentucky. The popular 20-cent Single 6 Jackpot delivered a significant payday for a TwinSpires.com customer on the penultimate day of the meet. 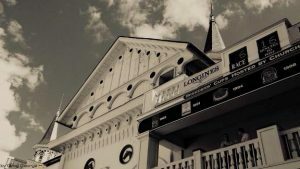 The six-race sequence challenged bettors to select the winners of six consecutive races daily but the Jackpot pool, which grew to $317,738 throughout the meet, was only paid if there was a single winning ticket. That occurred Nov. 24 when the sequence went down for a whopping $500,256.88. 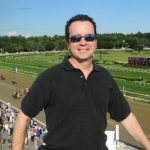 The lucrative payoff occurred one day after a bettor was deprived of the jackpot when a rare double-disqualification transpired in the Nov. 23 finale, and one day before a worthwhile mandatory payout would have been paid to the most winners of six races. In addition to the stellar racing, two additional events proved to be extremely popular with on-track guests: a special Halloween Family Adventure Day Presented by Kroger on opening day that featured fun activities for children and a giveaway of more than a ton of candy, and Thanksgiving Day, a Louisville tradition at Churchill Downs since 1969 where more than 8,000 turkey dinners were served with all the trimmings, making it the largest number anywhere in the region. Churchill Downs will conduct three racing meets in 2019 over 75 race dates. The 38-day Spring Meet will be staged from April 27-June 29 with the 145th running of the Kentucky Derby Presented by Woodford Reserve (GI) staged on Saturday, May 4. The 11-day September Meet is scheduled for Sept. 13-29, and the Fall Meet will run over 26 days from Oct. 27-Dec. 1. When guests return for the 2019 Spring Meet, three capital improvement projects will be complete. 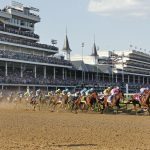 Churchill Downs has invested $4.4 million to improve the infield guest entry experience for the 2019 Kentucky Derby and beyond through the construction of a new Infield Gate at the corner of 4th Street and Central Avenue. In addition, Churchill Downs will complete the colonnade wall from the Paddock Gate to the Clubhouse Gate in a $3.9 million project. Those projects are occurring concurrently with a $5 million capital investment that will expand the Starting Gate Suites through the construction of a new 20,000-square-foot rooftop garden which will deliver a unique hospitality experience with exclusive sightlines and access for more than 500 ticketed guests. 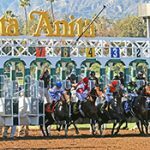 With a staggering $6,746,114 in “new money” wagered, Santa Anita’s closing day 20 cent Rainbow Pick Six Jackpot amounted to a total of $7,888,308 by fifth race post time, ensuring a massive all sources pari-mutuel pool of $18,948,679 on Sunday, which helped the track post increases in both on-track and all sources handle for the 22-day Autumn Meet. With 22 racing days producing $206.7 million in overall pari-mutuel handle, all sources average daily handle was up seven percent compared to last year. A total of $23.7 million was wagered on-track, which marked a three percent average daily handle increase over 2017. (With 19 racing days last year, all sources handle was $167.3 million, while last year’s on-track take was $19.8 million). A parade of short priced horses on closing day resulted in 10,466 winning tickets in the 20 cent Rainbow Pick Six, with each ticket returning $601.10. 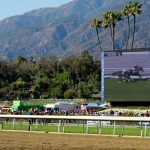 The Breeders’ Cup results in Kentucky once again underscored the depth of equine talent at Santa Anita, as no less than five Southern California-based horses tasted Breeders’ Cup glory over the two-day World Championships on Friday and Saturday. On Friday, Gary and Mary West’s Game Winner, trained by Bob Baffert, won the $2 million Juvenile, which followed a win here in the Grade I American Pharoah Stakes Sept. 29. On Saturday, Peter Miller pulled off an incredible year-to-year double, as Stormy Liberal and Roy H each won their respective races, the Turf Sprint and the Sprint, for the second year in a row while based at San Luis Rey Downs. Both horses are owned by Gary Hartunian’s Rockingham Ranch and David Bernsen, LLC. Stormy Liberal used a win in the Grade III Eddie D Stakes at 6 ½ furlongs down the hillside turf course Sept. 28 as his final Breeders’ Cup prep, while Roy H again struck Breeders’ Cup gold following a win in the Grade I Santa Anita Sprint Championship on Oct. 6. Trainer Michael McCarthy, a graduate of Arcadia High School, took Saturday’s Breeders’ Cup Dirt Mile with the Santa Anita-based City of Light. Owned by Mr. and Mrs. William K. Warren, City of Light won last year’s Grade I Malibu Stakes on Dec. 26 as well as the Grade I Triple Bend Stakes here on March 10. John Sadler put an exclamation point on the day Saturday, as Accelerate, owned by Hronis Racing, took the $6 million Classic. Based at The Great Race Place, Accelerate won three out of his five Grade I victories this year in Arcadia; the Santa Anita Handicap on March 10, the Gold Cup at Santa Anita on May 26 and the Awesome Again here on Sept. 29. Flavien Prat, who scored a stakes double by winning both the Grade II Goldikova Stakes and the Twilight Derby on closing day, finished as the meet’s leading rider with 20 wins, two better than a resurgent Rafael Bejarano. In the trainer’s division Jerry Hollendorfer and Peter Miller dead-heated atop the standings with 15 Autumn Meet wins, one clear of Doug O’Neill’s 14. 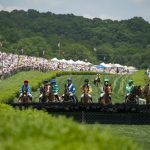 On-track attendance figures for the 22-day season totaled 158,000, compared to 137,000 attendees in the 2017 season, which had three fewer racing days. Santa Anita’s traditional Winter Meet will kick off the day after Christmas, on Wednesday, Dec. 26. 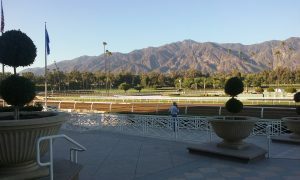 For additional information, please visit www.santaanita.com or call (626) 574-RACE. Is Horse Racing Dead? I Don’t Think So. Barbara Banke’s Stonestreet Thoroughbred Holdings went to $7.5 million to purchase full interest in the European champion Lady Aurelia during Fasig-Tipton’s The November Sale. She was consigned as hip 200 by Hill ‘n’ Dale Sales Agency. It is no accident The Derby Room is going into the building of a former restaurant, which is being remodeled at a cost of $500,000.